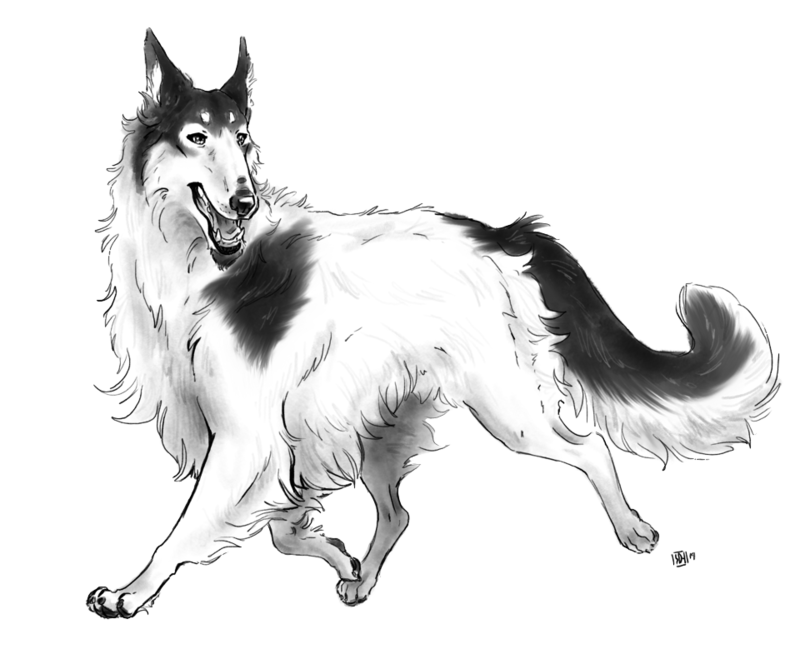 With word of Sapient's territory walls broken down, Ezra found himself curious as to if the pack had left anything behind that might be well worth a look. As Fantasy plodded happily through Gaspesia, her hair tied in tight knows down the roach of her neck, and her tail fastened in a bun, Ezra rode atop her with wide and curious eyes. The great expanse of space was certainly beautiful, albeit trees and trees, but not much else for the eye to see until the forefront of the Estate loomed in the distance. The pale linen of his shirt billowed in the summer breeze, littered with little drops of summer sprinkles that tapped on the thirst earth. A marbled gaze peered over the charcoal tipped flaxen knots at the paddocks that were slowly being stripped of their wood by those seeking an easy fire. Attention, however, fell to the grand estate that loomed like a specter in the front lawn that was eerily kept for this ghost town. Surely, there were those that still kept themselves here. He would be mindful, certainly, in their time of mourning should they be, but in the chance that Sapient truly was abandoned, the loot would well outweigh the risk. Lifting himself from Fantasy, he let her free roam for the moment, and made his way to the builidng. One of the windowpanes still held it's boning, despite the glass being shattered. A long nose slipped into sight and eyes peered into the shadow, his sight sunblinded so the poorly lit place seemed obscure,” Hello?” He called. It echoed,” Is anyone here? I don't mean to trespass,” He breathed, just a little quieter. Kenai had spent most of the evening last night finishing up her home that she had found for herself and to furnish it was another story. It would take time and effort to supply it with the things she needed, but it would work out well for what she needed. If only she had a horse. Kenai sighed at the fact she didn't think to take a horse when she left. It would have made her travels so much easier. Not that she minded the walking of course. Not wanting to beat herself up on it, Kenai continued walking and decided to explore more expanses than just her home range. She spent enough time doing that and was getting rather sick of it. Kenai heard of whispers of other packs before; Inferni, Cour des Miracles, Sapient, and Krokar. There were two others that she had heard mention of but she had all but forgotten them now. She would need to hear them a few more times to get them memorized, but one pack made her interested because the pack literally abandoned everything they owned on their packland and disappeared. It seemed Sapient had something happen from within and everyone simply.. up and left. Kenai felt this a perfect opportunity to go in and see what she could salvage. It would save her a lot of time in finishing her home. But where to begin? She had some direction to Sapient, but everything else she would have to guess at. Follow the well worn trail to a grand estate and stables on the other side. After a while, she did eventually find those and looked on in wonder at the size of the estate and just how much it had declined just by sitting there unused. It was too much of a bounty to not risk. As she walked up the path some more, a horse sat in the paddocks on the other side. A confused and alert expression formed on her face. Someone else was here? Or was it that someone still lived here? Kenai put a paw on her dagger attached to her belt above her right hip and walked to the door. The figure had just poked his head inside and called out to see if anyone else was here. So she wouldn't spook the other Kenai stayed back a bit. "By the looks of this place, I don't think anyone else still lives here." she said in her heavy Scottish accent. Kenai looked around herself as if to be sure. Fantasy's eyes shifted about, glancing and sniffing. The scents were still thick here, and even to Ezra it felt like it was almost a sin to cross that old boundary line, but here they were. Scavenging, like anyone wise would would want. The flaxen mane with lacing of charcoal at it's ends twisted and placed tightly on the roach of her neck moved with her spine as she parted her vision from the lands and onto the soul that approached them. Rather than seek interest in this being, the earthen and ashen hues that covered his pelt, Fantasy offered a small nicker and trotted away from the Estate to the east, across from the clearing and following off to the small storage area was there. The horse didn't seem to take too much of a liking of Kenai and trotted off, but perhaps it was because she was a stranger and the horse didn't know her well. Kenai was used to this from previous horses she worked with. Kenai wasn't upset about it at the least. As she watched the horse trot off, she looked upon the stranger with interest as he agreed. She looked at the building as he said they might be back for left overs, but given the amount of dust and dirt on the doors, it seemed unlikely that they might be back, but who knew. Kenai shrugged and wobbled her head from side to side as an indication of being unsure. This movement of her head was used for other things as a sort of acknowledgement, but not often. "Perhaps. It would seem like they wouldn't let it sit for this long though. What has happened anyhow? Was this a pack before?" Kenai asked as she walked up to the window to look inside. Then the stranger let out his hand in introduction and Kenai quickly turned to meet him. "I am Kenai Stone of Mistfell Vale. Originally I am from another far off pack land we homesteaded on. Pleasure to meet you." she said with her heavy accent and gripped his hand in a shake. A smile spread across her lips in happiness on meeting someone new. "Where is Amherst? Or is it a pack?" she asked. Kenai wasn't sure if the names of places were pack names or actual places of the land. She supposed if it were a pack that Ezra would have said "pack" at the end of the name. Who knew. When he asked if she was here to see what was left, Kenai nodded. "Aye, I had seen it a few times in passing but wasn't courageous enough to come look. That was when the scent was stronger, but now it's weakened a lot." Kenai stopped to ponder looking inside again. "Perhaps they will come back, and perhaps not. But if I take anything, I have brought some things in exchange in hopes they would be pleased with trade. I'd hate to steal, but in terms of items I need for living and survival,"[b] Kenai paused. [b]"I would rather use it and prolong my survival than see it sitting going to waste." Kenai was neutral about others possessions, especially if they had left them for this long. Kenai was a little wary of taking others possessions, but if it meant she could get by a little longer without relying on others then she would be just fine with that. The original owners would understand, wouldn't they? Fantasy had put enough space between them and had even thought to pretend to busy herself with sniffing at the storage building while keeping a glacier eye on the woman that neared Ezra. The mare wasn't not aggressive, or abrasive, but silly, if not a little apprehensive when siding with caution. Who wouldn't be after an encounter with Fire and his mount? Warily, she gauged the woman as she approached her rider, watched as she moved and listened to her tone as she spoke. It didn't take long for the mare to become a little more curious with a lack of shady behavior. “It was,” Words escaped his maw in a breath, his mind wandering through the obscurity of the history of the pack, aside from his dealings directly with their members, and the sour word through merchant tongues that passed by once and a while. He didn't know much about them, though their ways were civilized and their purpose toward intelligence was always entrancing. Of course, there were a few sore thumbs that cropped up like dandelions in a field of wildflowers, but every soul had their purpose. Their leader, by way of information from Tzila, wouldn't get the praise that a leader might warrant, however. The woman was honest enough, and kind. He'd trust her judgement," Sapient claimed these lands, not long ago. A pack of many skills, but a history among some traders to be a little spry in bad deals. It gave them quite a bit of grief, so much so, in fact, that it must have torn them apart." “Lady Kenai Stone of Mistfell Vale, I'm delighted to meet you,” A curtious, though small bow was offered, his hand pressing his shirt to his chest so it did not billow forward. The Frithr bound on his neck found his chest with the hollow whisper of wood against his flesh and bone as he righted himself,” Mistfell Vale is a fine place, from what I've seen,” He added, having not seen much of the place, but it's air of mystery was stunning enough to enjoy in silent awe. “Oh, Amherst! It is a fallen city reclaimed by our kind,” He'd forgotten his manners and finished the handshake with directions. Not all were veterans of Nova Scotia's contents, much as he had not been on his long days after arriving here years ago,” Amherst is a town that is Southwest of this place. Beyond Gaspesia and through Fort Cumberland. If you've found mountains or water, you've certainly gone too far,” A hand gestured past the expanse of the clearing behind her, just as Fantasy had decided to make herself more comfortable with her company. The draft mare plodded up carefully and stretched her neck as far as it would go, large nares echoed with the breath from her lungs. "I see. I could understand why they might have left this place in such a condition. Perhaps they were in a hurry to leave to get stable elsewhere? Perhaps emotions made it difficult to return? Such circumstances can leave us... well, off-center." she said unsure of how else to describe it. "My family went through something like that, but not to this extent." Kenai turned to face him as he continued to speak, happy to meet her and explaining he heard a lot of Mistfell Vale. "Yes, from what I have experienced thus far, it is a good pack to be in. There is a lot of different culture I am not used to and the lands have many varieties and sources of opportunity." Kenai smiled with the thought of being able to live off the land like she used to before in her old home. It gave her such comfort to think of these things. The mare came trotting back over after some time to meet Kenai and figure out who she was since she was being so kind. Kenai was surprised by this and turned to face the mare with a smile. "Hello there." she said softly as she held out a hand for her. Kenai could feel the strong inhales and exhales coming from her nose. The breath was warm with every breath she took. Eventually, Kenai reached in her satchel slowly to hold out a couple small carrots she harvested from her home and offered it to the mare. The mare was well built and seemed to be meant for long distances and companionship. Kenai missed having such a companion and wished that perhaps one day, she would be blessed with her own. When Ezra explained what Amherst was, Kenai became interested in possibly visiting this place once day. Kenai tried to remember the name in her mind so she wouldn't forget. She did this by saying the name a couple of times silently to herself. She broke out of it when Ezra agreed with her statement on survival and asked if they should go inside together. Kenai nodded in agreement and watched as he opened the door with a very loud creak. It seemed to echo, making Kenai wince slightly, and revealed to the two of them a dark and motionless inside. Kenai placed a hand on a knife she had belted to her hip and prepped it for whatever might be inside. "I'd like to not face rogues either, but if there are any it will be because of the abandoned items inside perhaps." she said stepping inside with Ezra's kind gesture. "Oh, and thank you. For holding the door for me." she said with a wink before disappearing into the darkness. Kenai seemed to accept his explanation well enough, which was good because he truly didn't want to get too deep into the information for the sake of not knowing, and she went further on to explain her own family situation and how it reflected. To his statement of the Mistwalkers, she wholeheartedly agreed," Something fresh and new always stirs the best in us," He mused. Her bright smile reminded him of his newer days in Vinatta and the Frithr that still dangled over his neck in memorium. He wondered, briefly, if Fiora still had her's about her neck, entwined in the black locks that cascaded down her shoulders. The image in his mind was gone as soon as it was there. No sense in being distracted while looting the old Estate. "Oh," He laughed," And that is Fantasy," Fantasy, too, seemed much more curious about the stranger as their polite conversation continued. The whiskers atop her indigo and rose muzzle tickled at her hand before the heavy horse took a step closer looking for something more of pet than a sniff. What she received was something even better than pets! It was treats! Hopping up a couple of times, mindful of the feet below her, Fantasy crowded the woman with affection and eager gobbled up the carrots she had been offered. While Fantasy sprinkled the earth with carrot bits, it seemed they both decided that going in together would be a better option. The polite Kenai stepped in the door and out of the sunlight, only to be followed in her path by the willowy merchant himself. The door was left open to allow the sunlight in, the dustmotes dancing in swirls as they disturbed the sleeping Estate. The first room was a grand hall, staircases on either side and two halls further down. Doors littered the bits of the halls that could be seen and filtered back into the darkness. Waving a hand at Kenai, opting toward the element of surprise and silence if they should happen on someone, he made his way to the right. If they worked in good fashion, they could be in and out of the Estate in an hour or so, judging by how many rooms were in it. Alabaster hand rested on the frame of the first door on the hall to the right. Marbled gaze peeked inside, only to find nothing but rays of sun slipping through the dusty glass. Some trash littered the ground, but it was nothing of mention. A broken wooden mug, collections of dry grass that had been carried in long ago and the whisper of a spiderweb in the corner. It seemed this room was empty and a gesture of his muzzle offered for her to check the next door. While she decided what she'd like to do, Ezra brushed his hand across the door, leaving a fresh imprint in the coating of dust that settled in the wood. This room was found and marked, so they wouldn't have to do more than glance to see if they'd been here already. From this moment on, Kenai was fairly quiet in her searching. She remained cued in to the behaviors Ezra gave as he communicated on where to go. The main entry ways and halls of the building were very empty and littered with debris and papers and was obviously rifled through at once time or another. Nature had also begun to take it back over as days turned into nights and seasons from hot to cold. While it was dark in here, Kenai could still see with the vague flashes of light that peeked in from cracks, holes, and undamaged windows in various places. As Ezra checked the first room, Kenai stayed close behind just in case. She had her obsidian dagger out as a precaution, but otherwise smelled nothing out of the ordinary. When he nosed for her to keep looking and swiped a paw on the dusty door to show he checked it, Kenai liked the idea and went to the next room. It seemed like an older office perhaps? Or very small library? Very few heavily damaged books were still on the shelves and a desk had its drawers opened and emptied. Kenai decided to take a closer look at the books and hoped they were still useable, but it was unlikely. She was surprised any were left afterall. At least there were two or three different books that caught her attention. Some on plant medicine, others on philosophy, and another childrens stories. Books were one of Kenai's favorite things as it held knowledge on each page inside the bindings. Plus, it told of old stories and the personalities of their authors. She didn't think of herself as a book snob, but if started on a conversation about books it would go on for hours. Her father often taught her about the significance of books and, if properly taken care of, how well they lasted and provided a wealth of information if she had no one to talk to. It increased the intelligence of the reader and their interest for the world around them. It also assisted with creativity and dreams. At least that's what Kenai believed. Turning around in the room, she saw other furniture pieces and more shelves, but rifling through the desk again revealed more charcoal pencils. These would be greatly useful and she slipped those in her bag as well. Never could have enough for writing tools! If Ezra wanted to see the inside of the room, Kenai made space so that he could come in. She swiped the door when she was done and continued on. Last edited by Kenai Stone on Mon Sep 03, 2018 7:19 pm, edited 1 time in total. The door of the empty room clacked as he shut it, the noise lifting to the roof with a short and muffled echo, and he followed in Kenai's footprints. Poking his head into the room, he found his new friend searching through several tomes. He offered a light smile as he met her eyes for just a moment and left her to the room. Finders keepers, he thought, and he wasn't going to press her for time or space in case she needed what was there. Mostly, Ezra was seeking out survival items and fabric, if there was anything here like the sort. They searched the lower level, room by room, and Ezra did manage to find a few new things that were of some use to him. There was a storage area, it seemed like, and a library, as well as a place to eat that didn't have very much to it. He knew Tzila to have been trading the books out, so it hadn't come as a great surprise that the shelves were pretty barren of them. There was a sitting room as well with several items of furniture, all clothed and worse for wear, but there was so much he could do with the tattered cloth. Pulling his knife from the high waist of his pants, he leaned over the arm of one of the sofa's and raked the blade down it's seams. Time seemed to come to a stop in the building as the pair searched for anything good. The smell of dust wafted in and out of her nose as they rummaged through whatver was left, and mold from certain rooms was definitely present. Who knew how much longer this building would stand strong before it began to rot. It was clear the building was well taken care of so perhaps it would be quite some time before any sort of excessive wear and damage would show. Kenai continued to follow Ezra as he looked through things and stripped some of the furniture for their fabrics. Kenai smirked with interest as she watched him and asked if she had found anything good. "I believe so. Some books with short stories, plant medicine, and some philosophy. Boring reads for those not interested in such big topics. I see you have found some fabrics?" Kenai came closer to get a better look. They were covered in dust, but she liked the color and patterns. Too bad the furniture was now a little uglier than before. The fluff and wood could be used for different things later. Perhaps upstairs they would find much more interesting things, like clothes or other personal belongings. Kenai had seen others of her kind wearing garments, so perhaps she would be lucky. Kenai tried to think of what colors she would adore as she looked around the common room. Light colors? Dark? Heavy weighted? Thick or thin? She supposed it would depend on what was left over and what she felt like wearing. She hadn't really worn anything before, so it would be a new experience for her. Ezra on the other hand was wearing a linen shirt that complimented his features quite well. She wondered where he might have obtained that from as she knew of very few cloth makers. "I guess we go upstairs now?"